Photographers have long struggled with how to include a broader range of tones in their photography. It has always been a huge issue – even going back to the film days – because the range of tones a camera can capture is much more limited than what our eye sees. We may see detail in bright and shaded places, but the camera can’t do that. It either “blows out” the bright portion or “silhouettes” the darker portion (more about why in a minute). The problem became even more acute in digital photography, since digital sensors couldn’t capture as wide a range of tones as film cameras. However, digital capture also offers us the cure – or at least one cure – in the form of HDR or “high dynamic range” photography. This is a great tool for capturing a vastly wider range of tones than any camera could on its own. Understanding and using this tool will vastly improve your photography – I guarantee it. Ignore any detractors you might have heard – you need to include HDR in your toolkit if you are going to photograph the outdoors, with its constant wide range in tones. 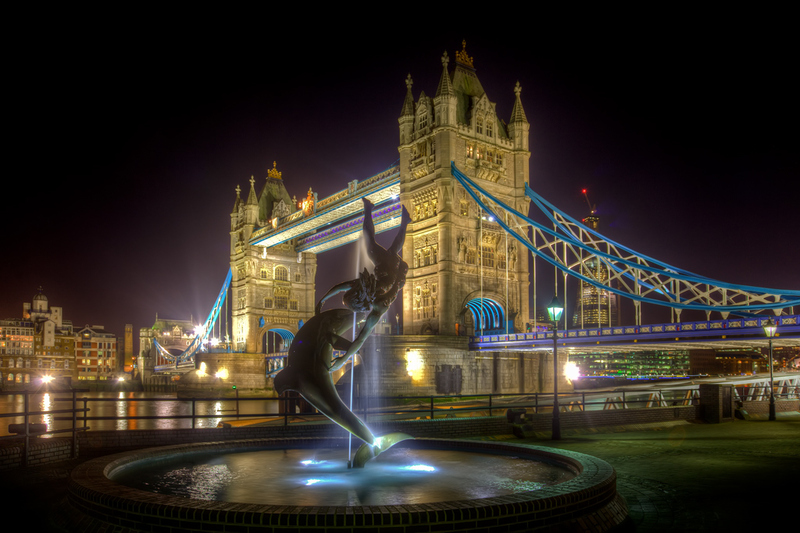 In this article, I’m going to explain HDR photography to you and show you how it works. It is primarily designed for those that have heard of HDR but aren’t familiar it. In later articles, which are under way now and will be posted soon, I will show you how to do it, walking you through what you need to do with your camera and how to work the software. First, let’s talk about dynamic range. The dynamic range of a camera is its ability to capture tones between pure white and pure black. The wider the range, the better. You have probably noticed that sometimes when you take a picture outdoors, the foreground is exposed correctly but the sky is completely white with no detail (referred to as “blown out”). Or other times you have probably taken pictures where the sky is correctly exposed but the foreground is completely black with no detail at all. This is due to inherent limitations in the dynamic range of cameras. The camera just cannot capture such a wide range in tones all at once. The camera can capture all these tones – just not all at once. It is sort of like how your eyes can see in the dark just fine, and they can see in bright light just fine, but they cannot do both at the same time. Think about walking out of a dark movie theater in the middle of a sunny day – your eyes hurt and you cannot see anything. You need time for your eyes to adjust before you can see in the bright light. Your eyes can see in the bright light just fine – just not at the same time as they are seeing detail in the dark. Thus our eyes have a limited dynamic range as well (but much wider than a digital camera). That explains the concept in a nutshell, but you can learn more about it in this article on Understanding Dynamic Range. Notice I keep saying that a camera cannot capture a wide range of tones all at once. It is not that there are tones that cannot be captured by a camera. Lighter tones can always be captured by underexposing, and darker tones can always be captured by overexposing. They just cannot be captured in the same picture. And so, clever people came up with a solution to this problem. You just take multiple photos of the same thing and combine them later using special software. All the tones in a scene can be captured in the multiple pictures. They can be put in one picture by software later. The process, boiled down to its simplest form, is that you take multiple photos; with one at normal exposure, one or more underexposed, and one or more overexposed. Then you import those photos into dedicated HDR software, which combines the tones of the three pictures to keep them all within the available dynamic range, without having any part of the picture blown out or pure black. In the typical outdoor scene, the HDR software would blend the tones to keep the sky from being too bright and keep the ground from turning pure black. And voila, you have a picture where all the tones are within the dynamic range of the camera. The explanation above makes it sound like you just bracket your pictures, import them into some software, and it spits out a perfect image every time. Of course, that is not the case. The HDR software can and will create an image that keeps the tones within the dynamic range of your camera – but it cannot necessarily create an image that is any good. Or that is exactly what you want. Or that doesn’t look surreal. All that leads to the challenge of HDR for those that use it – and to the criticism of HDR by those who don’t. Many photos created by HDR software have something called the “HDR look.” These pictures tend to be surreal with weird lighting effects and often a little grungy. They do not look realistic, but when HDR first came on the scene there were a great number of photographers that actually liked this HDR look. Of course, this drove traditional photographers slightly insane and you began hearing a loud chorus of photographers against HDR. Most were quick to clarify that they weren’t necessarily against HDR as a tool, but that they were against the HDR look. In fact, you will see something of an HDR cycle in most photographers. Most people, on seeing their first HDR pictures, think they look really cool and want to try it out (there is a saying that 100% of non-photographers love HDR). When new photographers try out HDR, however, they typically overdo the effect, but they don’t care. They like the HDR look. After a while, most people then go through a phase where they look down their nose at HDR and those who use it. They consider themselves above HDR. They complain about the HDR look. They acknowledge that it can be done tastefully in certain circumstances, but seem to believe that those circumstances are exceedingly rare. Some people never get over their disdain for HDR, but most come to some acceptance of it. Usually, those photographers will (sometimes grudgingly) accept HDR as a useful tool but express displeasure at anything like an HDR look. As an outdoor photographer, ignore everyone on all sides of this debate. You need HDR. It solves a huge problem that has always plagued outdoor photographers and is particularly acute in the digital era. Dynamic Range: Obviously, there are many times where it is the only way to capture all the tones of a scene. Given the inherent limitations in the dynamic range of digital sensors (and film), you will run across scenes where all the tones cannot be captured at once. Sometimes that will be ok with you, and sometimes it will not. Where it is not, no matter what you do to the picture, you cannot bring back blown out highlights or black shadows. The only possible way to include detail in these areas is by blending exposures. No Cost or Obligation: In addition, bracketing your photos costs you nothing. In this era of cheap memory, there is no reason you cannot take 3 or even 5 photos (with some being overexposed and others underexposed) to go along with your normal exposure. And frankly, doing so does not compel you to make an HDR picture. You could later just use one of the photos and edit it without running them through the HDR process. Or you can combine the photos without the HDR software. Adding Realism: You can make HDR has realistic as you want. You can make it so that nobody even recognizes it as HDR. I will show you how to use HDR software to get realistic results. Further, I will show you how to blend in other exposures to add realism. Using HDR does not necessarily involve creating a particular look to your photos. Creating the HDR Look: While much of the focus here has been on creating realistic photos without the HDR look, there is nothing wrong with including an HDR look to your photos if that is what you like. You can make your pictures as surreal as you want. It is, after all, your picture. What Do You Need to Do HDR? Photomatix: This is the most common dedicated HDR software, and many consider it the best. It costs $99 from a company called HDR Soft (this is not an affiliate link – as is true with all the links here). HDR Efex Pro: This program is a part of the Nik Collection by Google. The entire collection costs $150 and gets you the premier black and white conversion software, great HDR software, and several other very nice plug-ins. At times, you will find that HDR Efex Pro gets you the best HDR results. Photoshop: Adobe has included HDR processing in Photoshop for quite some time, but it was never any good. In recent additions, however, the Photoshop version of HDR has improved markedly and it has focused on getting super-realistic HDR photos. In fact, the most realistic HDR photos probably come out of Photoshop – and you may already have it. Lightroom: Adobe now includes an HDR processing feature in Lightroom. It is, to be quite honest, terrible. The results are often no better than you can get using the Lightroom Develop module to reduce highlights and increase shadows. If you already have Lightroom, and do not want to get any other software, it is an available option. You can get by with any one of these products. If you already have a DSLR and Photoshop or Lightroom, you have everything you need to get started, so this process will not necessarily cost you anything. If you are just starting out, I would at least add Photomatix for $100. To do the sort of HDR I’m talking about, however, you should have all of these applications set forth above. You won’t be sorry you did. Photomatix is state of the art and not that expensive. You should get Photoshop and Lighroom anyway because of the vast editing power and organizational tools they provide. Finally I would recommend the Nik Collection even if it didn’t have HDR Efex Pro in it. It has many applications that will improve your photographs. What else should you have? You should have a tripod and a remote shutter release for use when taking your bracketed photos. You can shoot your bracketed shots without a tripod, by just holding the camera very steady as you shoot. It is always better to use a tripod though. A remote shutter release will eliminate any vibrations or movement caused by touching the camera, which you would have to do a lot in taking bracketed photos. Is all of this cheap? No. But what I’m writing about here is uncompromising HDR, and to do that, we need all the tools. If you want to dip your toe in the water, start by getting Photomatix and work with it for a while. You can do a lot with that. Once you have what you need, it is time to get started with HDR. All these articles are coming very soon, and they will be links as soon as they are posted.